Here is my piece of heaven. This old girl doesn't move anymore. This will be her final resting place. I bought it for $250 cash about 5 years ago. It had a bad leak over the bed. Tore out the ceiling, walls and floor and re-did the back "bedroom" and fixed the roof. This spring I'm going to tear out the bathroom, re-check all the wiring and remove all the non-used closet space to open it up on the inside. 12Gauge - that's pretty sweet! That's what I did, bought me an old "hunt camper" for $200 bucks, gutted it, opened it up, etc...wouldn't trade it for the Ritz! Well, unless they build one in Union and told me I could stay for free! Last edited by tidmarshsmith5; 11-11-2013 at 06:11 PM. Here's a better pic of the floor before I built a bed in the backend (used to have a futon there). Talking to my 13 yr old just now, think I'd like to move all the kitchen stuff to the end where his futon is and then move his futon below the a/c unit and open both those walls back up for the roominess...then we would be L shaped...hmmmm...gonna take a look at that this weekend...that sounds like a plan! Alright folks...have an opening for a long camper (one of my 80 year old Gents sold his camper to his sister as he just can't get out like he used to)...anyway, these are the good spots. If interested PM me or give me a call. Have a fully furnished camper spot for rent (I own the camper and stuff in it); it comes with fridge, a/c unit, bed and a dinette table that turns into a bed. Will put pics on here this weekend. The gentleman that owned it took very good care of it (yep, it's an older camper 14x8 and he says sleeps 2 comfortably)...he kept the roof up and put an awning over the front "sitting" area. If you want to come camp this year and don't have a camper - this is the deal - $300 for this spot for 2014 (we're only open Turkey and Deer Hunting WMA seasons). 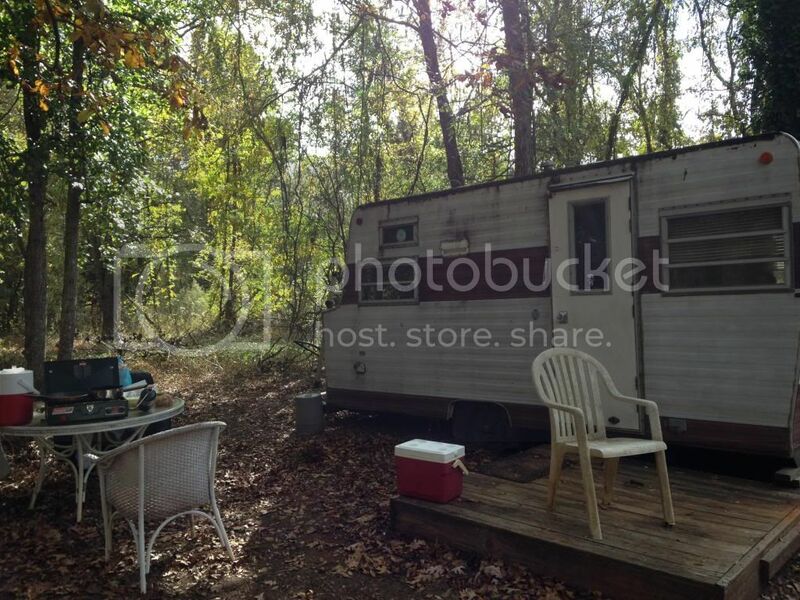 This is only for rent (can't be moved)...$300 for Turkey & Deer WMA Season...has a fridge, a twin bed and a dinette that folds into a twin bed. Has stove, fridge, a/c (has sink but no water hookup) and a nice closet for gear. The owner I got it from took really good care of it and he says has no leaks. The cabinets all work as they should as do the 3 drawers. Give me a call if interested (864-423-9373). Last edited by tidmarshsmith5; 01-31-2014 at 04:31 PM. Had a couple of calls - 296 Minnow Bridge Rd Union SC (if you can find Sedalia Dove Field off Firetower Rd go to stop sign take right and we on left) or just call me, 864-423-9373. A little hunt camp humor...one of our good buddies and a great all around guy likes to cook down there...so the bro and I made him a sign and hung it up on his camper...can't wait to see his reaction when he pulls up and sees it! That's funny right there! hope he likes it! Thats a good thing when you have a lot of brothers...if he doesn't we'll just beat him up! haha! I don't have a hunting camp but I do have a Mobile home with a 14x60 deck & screened porch on the water side on Clark Hill Lake. Has all the amenities of home.......We spend a lot of time there(home away from home).........We fish and crow hunt and my son duck hunts..........My little piece of heaven! Does anyone use the Fell Hunt Camp or other Sumter National Forest camps in the hunting districts? I know they state no shooting within 300 yards of these camps, but is WMA public land usually accessible walking from these "camps"? Thinking about using for turkey, deer, hogs, and coyotes. I'll update my own question. Just spent 3 days at Fell Hunt Camp in Long Cane District. Scouted, called, watched and waited along a three mile stretch of treelines, fields and forest in mornings and evenings. Not a single gobble or significant signs. Only one footprint in a mud hole I stalked for three hours. The campground is rustic but decent for $5/night. No utilities except a few water filling spigots. One latrine (Oops, don't look down there). No other hunters there. Just horse riders and relaxers. Too bad some of these USFS camps aren't open during hunting seasons. Parsons Mtn Lake only open May- 15 Nov.
Any others to recommend for next season? Anyone planning to deer hunt around Fell Hunt Camp, or the private or WMA lands toward Parsons Mountain Lake? Might try the public lands once rifle season starts. That's in the Sumter Nat Forest, South of Abbeville just so you know. Last edited by ltcolmac; 09-13-2016 at 07:08 PM. I stayed at Fell Hunt Campground 2x during deer season, 2x during turkey season. Is there anyone on this forum who sets up a camp there the whole deer season? Is there a club that sets up near the front each year? Or is it all just individuals? Seems like I see some of the same campers each year. However, I usually go during the week and there’s never anyone there to ask. I have a couple friends that left their hunting clubs and we’re thinking of going to Fell together next season. enjoy my time at camp as much as possible. Tom Bailey (owner) has a campground near corner Prospect corners & Old Bumcombe Rd. I own a camper there. Its in Cross Keys. 915-6046.